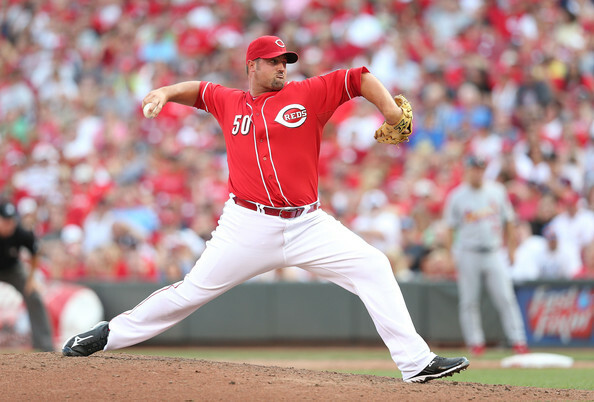 The Milwaukee Brewers have acquired right-handed relief pitcher Jonathan Broxton from the Cincinnati Reds in exchange for two players to be named later, the teams have announced. The news was first reported by Ken Rosenthal of FOX Sports earlier today. The Brewers move of Broxton comes just before the midnight eastern playoff-eligibility deadline today on August 31st. It is unclear whether the Brewers claimed Broxton off waivers, but considering his $9 million salary next season, plus his $9 million team option with a $1 million buyout for 2016, it seems very likely that he did clear revocable waivers. Salary or not, Broxton will be an immediate upgrade to a Brewers bullpen that has the 13th-highest ERA and 10th-highest FIP on the season. Since the beginning of August, however, Milwaukee's bullpen has been among the worst in the major leagues, ranking 26th (or fifth-worst) in the major leagues for FIP. The 30-year-old Broxton is in the midst of a three-year, $21 million deal that he signed with the Reds in November 2012. He will likely be an immediate upgrade to the Brewers' bullpen, as he is 4-2 with a 1.86 ERA and a 1.014 WHIP in 51 appearances. However, his 3.52 FIP suggests that his ERA has been better than it really should be, likely being helped by the Reds stellar defense. His 37 to 17 strikeout-to-walk ratio in his 48 1/3 innings is something to be concerned about. Broxton first came up to the major leagues as a flame thrower with the Los Angeles Dodgers, with his fastest pitch ever recorded at 102.6 MPH (2009). He can still throw his fastball into the 96-97 MPH range, but it usually is around 93 MPH. One really good upside for the Brewers is Broxton's playoff experience. He has pitched in 16 playoff games, including five National League Championship games in 2008 and 2009 against the Philadelphia Phillies. The addition of Broxton seems to make sense for the Brewers. Bullpen pieces are hard to come by, especially one with as much playoff experience as Broxton himself. His salary is a bit high, but depending on who the Brewers had to give up, the deal seems to be a very good trade for both sides. The Oakland Athletics have acquired Adam Dunn from the White Sox in exchange for minor league right-hander Nolan Sanburn, they announce. Sanburn, the Athletics 2012 2nd round pick, is the Athletics' twelfth-best prospect, as ranked by MLB.com. He is 3-1 with a 3.28 ERA and a 1.444 WHIP in 42 games with High Single-A Stockton. Read the complete story on Sports Rumor Alert. The Seattle Mariners announced that they have extended general manager Jack Zduriencik to a multi-year deal contract today. Zduriencik has been on the hot seat now for some time, but the Mariners success this season has likely saved his job. The Mariners are currently in sole possession of the second Wild Card spot, as their 71-59 record gives them a 1/2 game lead over the Detroit Tigers. This offseason, Zduriencik signed Robinson Cano this offseason to a ten-year, $240 million deal, signed Corey Hart to a one-year, $6 million deal, and acquired Logan Morrison from the Miami Marlins for reliever Carter Capps. Usually teams that have a big offseason do not have the best regular season, but Zduriencik played his chips at the right time. He had a big offseason while mixing with homegrown talent with players such as Kyle Seager, Dustin Ackley, Hisashi Iwakuma, and Felix Hernandez. The 63-year-old Zduriencik, who is an alumni of California University of Pennsylvania, worked his way from an area scout in the New York Mets organization back in 1983 to general manager of the Seattle Mariners, where his tenure began in 2008. He was hired by the Mariners after spending three years with the Milwaukee Brewers, where he was given a large amount of credit for bringing the team back into playoff contention in 2008. Brewers GM Doug Melvin said, "No doubt about it, he [Zduriencik] deserves almost all the credit for the young players we have. The players he has drafted are making an impact at the big league level." The Mariners have a 430-510 record in almost six full seasons under Zduriencik. The Chicago Cubs will promote outfielder Jorge Soler to the major leagues before Wednesday's game against the Cincinnati Reds. Dave Kaplan of CSNChicago.com first reported the news on Twitter late yesterday evening. Soler becomes the third Cubs prospect to be promoted to the major leagues, following the promotions of outfielder/second baseman Arismendy Alcantara and shortstop/second baseman Javier Baez. Baez was ranked as the Cubs' second best prospect, and fifth-best prospect overall, in the mid-season ranking by MLB.com and has been hitting .207/.244/.488 with seven homers and 11 runs batted in in 20 games since being brought to the MLB. Alcantara was ranked as the 89th best prospect by MLB.com prior to this season, and in 41 games since his promotion, he is hitting .228/.286/.359 with four home runs and 14 runs batted in while providing very good defense, even with a shift to the outfield. Soler will get his feet wet in the big leagues for the final month of the season. The 22-year-old has spent most of his 2014 campaign in Double-A and Triple-A (while also playing in eight games in Rookie), dominating the pitching for a .340/.432/.700 slash line with 15 home runs and 57 runs batted in in a very limited 236 plate appearances. Hamstring injuries have just limited him to just 62 games this season, but when he has been on the field, he has been very solid. Keith Law of ESPN.com ranked Soler as the 28th best prospect in baseball during his midseason top-50 rankings. He called Soler's bat speed "electric" and noted that he is a "monster if he can just stay on the field." Law noted that Soler could have profiled as a top-10 prospect due to his offensive abilities alone, but his struggles to stay on the field had to keep him grounded at 28th. He noted that his arm and athleticism could make him an average defender at right field, where he is likely to end up. The future is coming into sight for the Cubs. Soler has been in their organization since 2012, when the Cubs locked him up to a nine-year, heavily backloaded $30 million deal. Now he, along with other of their top offensive prospects, are either really close to the major leagues or are in the major leagues. If Soler can prove that he can hit big league pitching (which is the hope), expect him to be in the Cubs' starting outfield on Opening Day 2015. The Los Angeles Dodgers have wanted another rotation piece ever since the trade deadline. Even though July 31st has passed, they still are looking for yet another starting pitcher. Even though Los Angeles has a solid top of the rotation in Clayton Kershaw and Zack Greinke, injuries have caused the Dodgers to resort to Dan Haren, Roberto Hernandez, and Kevin Correia as their final three starters. In order to bolster their rotation, the Dodgers are currently "going after" Mets right-hander Bartolo Colon, an industry source told Cover Those Bases. Colon "intrigues" the Dodgers, who are looking for another starting pitcher, the source continued on to say. Colon was placed on revocable trade waivers by the Mets, as Ken Rosenthal of FOX Sports first reported this past weekend. The Mets signed Colon this offseason to a two-year, $20 million deal. He still has $11 million left on his deal in 2015--perhaps allowing him to get to the Dodgers in the waivers, or even allowing him to pass through. The deal has seemed to pan out for the Mets, but Colon, at age 41, could be nearing the end of his line. Considering the fact that New York is not contending this season, it could be their final opportunity to get good trade value for Colon. On the season, Colon is 12-10 with a 3.82 ERA, 3.35 FIP, and a 1.147 WHIP in 25 starts. He has a 130 to 22 strikeout-to-walk ratio in 167 1/3 innings pitched on the year. He has a 3.94 ERA and a 4.05 FIP over his 17 year career with the Mets, Athletics, Yankees, White Sox, Red Sox, Angels, Expos, and Indians.